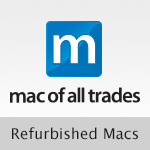 Looking to purchase gentlyused or refurbished Macintosh computers or accessories? Lapin Systems is a registered affiliate of Mac of All Trades, the pricing leader for buying and selling used Apple/Macintosh computer hardware on the internet. Sign Up and Get $10 Off Your First Order! Announcing our new service location at 1547 N Larrabee in Chicago!